I wouldn’t have ever thought of asking about where they came from at the market. Thank you for sharing about that. Mmmmmm… blueberries! I started drooling as soon as I saw that picture. And a great recipe too! 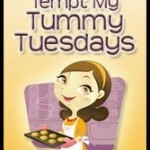 Thanks for sharing, and thanks for stopping by my blog today too! Have a great day! 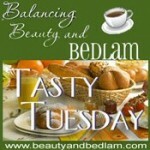 Thanks for participating in Tasty Tuesday! Welcome! I love blueberries and can’t wait until they’re ready in my area. I’ve never had blueberry shortcake. Sounds yummy!!! I personally love blueberry smoothies. Those blueberries look wonderful. I’m like you, I only buy local in the summer — so good — so fresh! I do want to support our local farmers, but they also taste better. Saturday we were in the grocery store. My husband asked why they didn’t have the local blueberries. (We buy blueberries every week; me for my cereal each morning.) He was told the farmer couldn’t find anyone to pick the blueberries! What a shame. Blueberries going to waste! I know what you mean. Sometimes I see produce boxes from California at our local farm stand. Huh?! Your blueberries look beautiful, and that recipe is making my mouth water!!! Really nice post. I love all berries! Thanks for the recipe.. I love blueberries. Right now they are plentiful. This looks delicious. I agree! Always by locally grown when you can!!! Thanks for sharing the recipe. I was just thinking about blueberry shortcake. The blueberries look so delicious! Thanks for the recipe. It sounds great! I am enjoying all things blueberries right now. YUM! I haven’t gotten enough blueberries from our bushes yet, but I can’t wait to pick at our neighbors house. I love blueberries. Our local berries won’t be ready till August. The organic farm where I buy my blueberries every year told me to take the whole box and pop it in the freezer and it freezes just like marbles. No sticking together. Because they are not sprayed they really are clean enough to do this. You can leave them that way for a long time or quickly pop them into freezer bags. That is if you don’t eat them all up first.